Is it raining gold or are my Golden Rain Tree flowers falling again? Alas, the difficult questions the Golden Rain Tree owner must ask every summer when gossamer golden flowers blossom in waves along the cascading shape of the Golden Rain Tree. The small tree branches irregularly, drawing the eye immediately to its eccentric texture, shape, and color. When the flowers fall to the ground, they not only resemble “falling gold” but they also create a golden carpet. This ornamental accent tree also produces lantern-like seeds that are papery in texture. These orange-brown lantern seeds are interesting to observe and attract the eye. 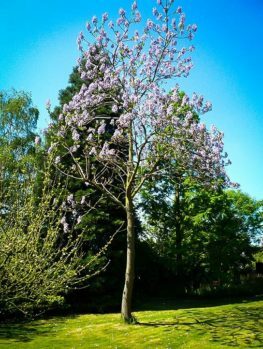 The Golden Rain Tree is perfect for the gardener searching for a tree with a bit of panache and style! 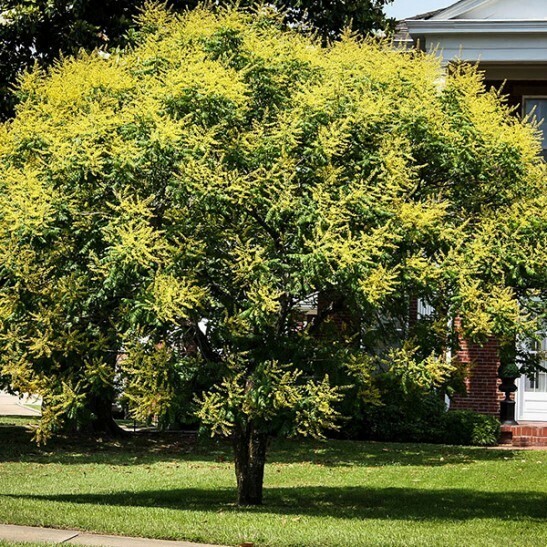 The Golden Rain Tree is a beautiful ornamental tree, and it is extraordinarily popular among gardeners in the United States. This tree is aptly named; summer brings forth vibrant yellow flowers that remind the onlooker of falling rain when they eventually fall to the ground to create a golden promenade. It is, however, enjoyable to observe in all seasons. 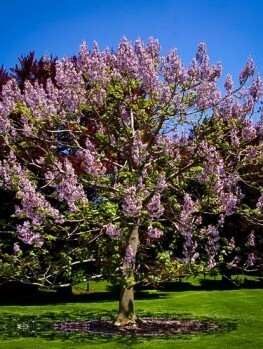 In spring, the tree’s shoots appear pinkish-purple, which turn green as the golden flowers burst forth in summer. Fall brings a golden carpet silhouetted by the Golden Rain Tree’s seeds, which are reminiscent of Chinese lanterns. These rich orange to light brown papery lantern seeds hang from the tree, engaging the onlooker (and proud planter) until winter. This interesting tree is also easy to grow and maintain. Frequently planted to line city streets, the Golden Rain Tree is a hardy, strong, and showy tree perfect for your garden. Any tree that is named something as wonderful as the Golden Rain Tree clearly has some bragging rights. 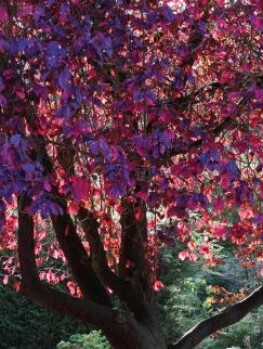 Most landscapers choose this small ornamental as an accent tree. 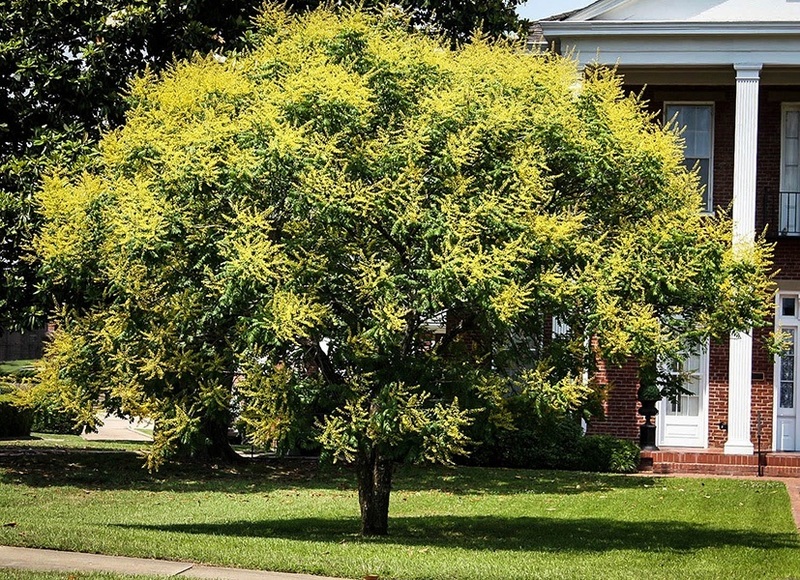 With unique textures, flowers, shapes, branching, and seeds, the Golden Rain Tree attracts attention all year long. Perfectly planted in the center of the garden, where its golden raindrops will enrapture all, the Golden Rain Tree is hardy when planted in tight quarters. 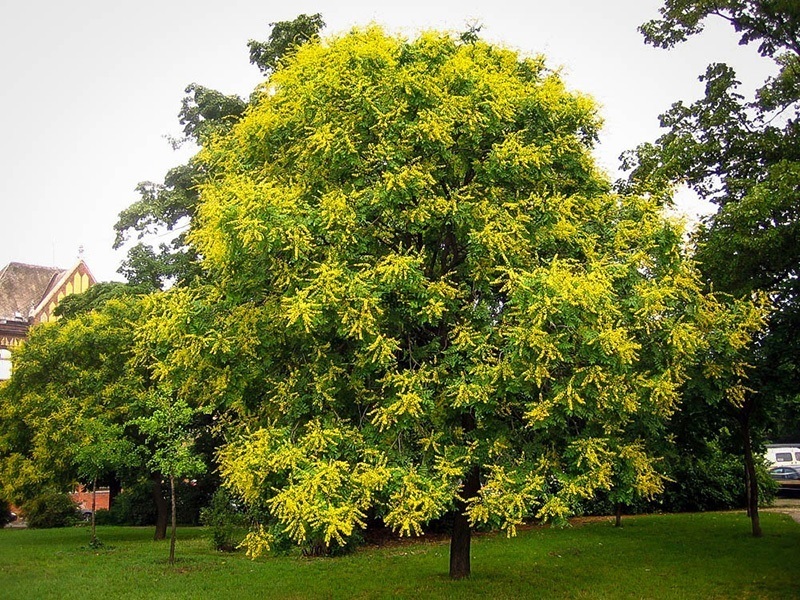 The Golden Rain Tree has a fast growth rate, which varies from 13 inches to more than 25 inches in the growing season. 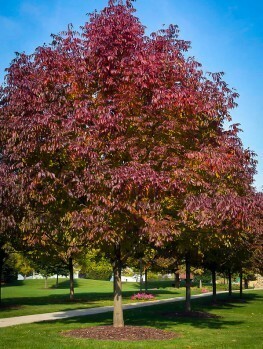 Remember, your tree’s growth rate will depend greatly on the planting process, watering schedule, unique environmental factors, and soil conditions in the planting location. While the Golden Rain Tree varies slightly in height, it will typically grow to have a width of 30 feet. The fast growth of the Golden Rain Tree means it quickly reaches this mature height so it can dazzle in style. Proper planting is one way to ensure successful growth of the Golden Rain Tree. Simply locate a spot in full sun or partial shade where the Golden Rain Tree can captivate onlookers. Dig a hole twice as wide as the root ball with a depth matching the root ball’s height. Hold the tree in the hole and backfill with soil and water. Apply mulch if possible. The Golden Rain Tree grows well in USDA Hardiness Zones 5-9. They prefer well-drained soil, but adapt with ease to soils that vary in pH, drainage, and moisture. Spring brings new growth, which on the Golden Rain Tree appears as pinkish-purplish off-shoots. These rapidly turn deep green and will quickly be covered in the fanciful flowers for which the tree in known. These small golden gossamer blossoms scrunch together in clusters may seem to be the pinnacle of the seasonal enjoyment. But it is, in truth, the falling of these flowers from which the Golden Rain Tree takes its name. The clusters fall in groups, which makes it appear as though bounteous metallic raindrops are reaching your garden floor. In fact, these fallen flowers form an appealing carpet to add new interest to the garden. It would appear this is the end of the show, but then the Golden Rain Tree reveals large seed pods. These brown to rich orange papery pods hang from the tree and suggest Chinese lanterns. The beautiful show continues! In addition to being a successful ornamental tree, the Golden Rain Tree is also popularly planted because caring for it is easy! Low maintenance never had a better spokesman. 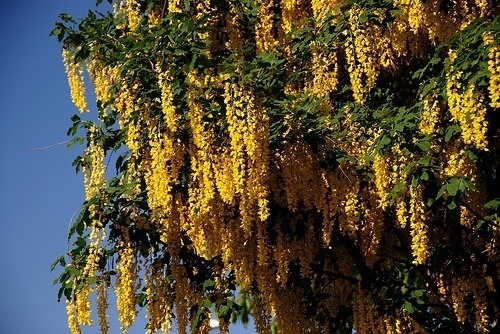 The Golden Rain Tree requires no pruning. Since it is hardy to heat, cold, and pollution, the Golden Rain Tree does not require rigorous watering or adept attention. The first time gardener cannot but help succeed to stun with this beauty. The Golden Rain Tree is beautiful and easy – what more could you ask? Moderate clean-up is needed in the fall, as the fallen flowers and leaves may need to be cleaned based on the location in which they’ve been planted. Introduced to the United States in 1763, the Golden Rain Tree attracts bees. Mulch can be applied in a 3-inch layer in a 3-foot radius around the base of the tree to help ensure proper moisture and air dispersal. Be careful! 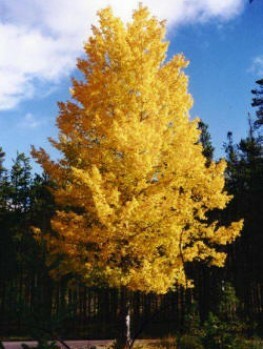 Poor quality Golden Rain Trees are often sold as the real deal! These poorer varieties are sold bare-rooted and branch cut and will simply not perform well. Nurseries that sell these poorer varieties are trying to cut costs by replacing your tree with a poor-performing variety. 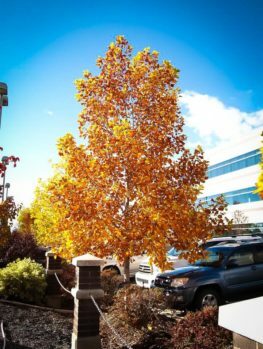 What makes this worse is the replacement tree often lacks the beauty and low maintenance that make the Golden Rain Tree great! To get the best, you need to use the best. The Tree Center ensures that quality care is provided to your Golden Rain Tree during its most vulnerable initial stages of growth. Highly trained staff seek to provide the tender love and care your Golden Rain Tree requires so it can offer you the easy beauty and care for which it is known later on. 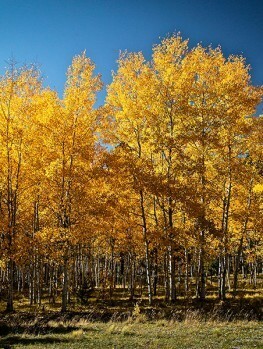 A wide range of Golden Rain Trees are available from The Tree Center. But act now! 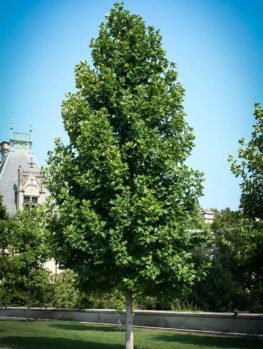 This popular tree is a fast-seller and can easily run out-of-stock. If you want bountiful beauty and manageable maintenance, then visit The Tree Center today for the best of the breed!